A Shanghai Daily reporter's personal observation of India's smartphone market. 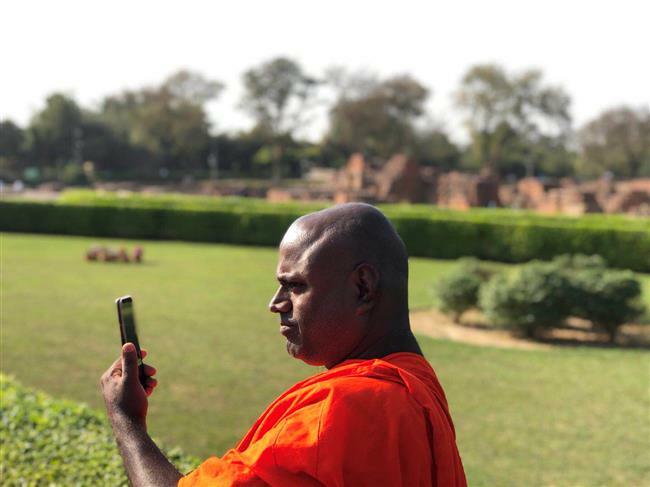 A monk stares his phone in a buddist temple in Sarnath of India. I will never forget scene at a guesthouse in the remote town of Bundi in the northern Indian state of Rajasthan, where I was staying on a recent holiday. Some 100 young Indian women were doing talk shows and sensual performances through personal broadcasting programs via a mobile application. They received virtual applause and awards from those of us at the inn. Their boldness, if I may call it that, was in sharp contrast to what I perceived to be shyness among most Indian women I saw on my travels. I was also struck by the fact that few people seemed to use handsets to access the Internet during daytime. “You can kill time and even find girlfriends through the applications,” according to a 24-year-old guesthouse staffer who called himself Peter. He said he is a fan of Tinder, WhatsApp and the broadcasting platform music.ly, a Shanghai-based startup focusing on overseas mobile markets. Even though I was on holiday, I couldn’t escape my curiosity as a technology journalist as I toured India. It was interesting to note the contrasts between the conservative, religious India and contemporary digital age society. India’s emerging technology market is a vibrant one. The world’s second most populated country has a mixed market, with both smartphones and so-called “feature” phones, which incorporate features such as Internet access, basic calls and short messaging but lack the advanced functions of smartphones with reasonable prices. India has millions of selfie fans, cheap data packages and sufficient 4G network coverage. Chinese brands like Xiaomi, Oppo and Vivo are expanding here. Even though 4G networks are available in 95 percent of India’s regions, many people are still using feature phones, including Nokia models with black and white screens. As I observed in Rajasthan, many Indian users have difficulty accessing data services. India was the world’s biggest market for feature phones in 2017, with sales of 164 million units. Feature phones, without smart operating systems like Android or iOS, remain relevant to a large consumer base, according to International Data Corp, a US-based research firm. On the other hand, India’s smartphone market sales last year grew 14 percent to 124 million units, making it the fastest growing of the top 20 smartphone markets globally, IDC said. India is now the world’s third biggest smartphone market. Its growth contrasts with China, the world’s largest market, where sales are slowing for the first time, and the US, where sales have remained relatively flat, analysts said. The middle- and entry-level market segments in India, where phones cost less than 15,000 rupees (US$231), are the fastest growing sectors. The top 10 best-selling phones in India, which include Xiaomi, Samsung, and Oppo, are mainly priced at 10,000-18,000 rupees. 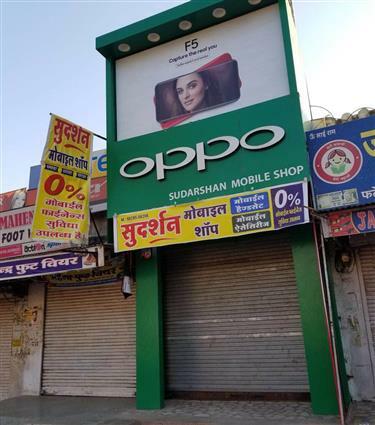 An Oppo store in Jaipur. Indian people love taking group selfies with tourists and sharing the photos on social networks such as WhatsApp and Facebook. Ael PJ, the son of our guesthouse owner in Udaipur and a founding partner of the social network 1LBL, said he wants to establish a social platform connecting Indian business leaders globally. Various mobile applications are expanding in the Indian market, tapping a huge combined base of smartphone and feature phone users. They include taxi-hailing apps Ola and Uber, mobile payment Pay TM, food ordering application Zomato and digital entertainment apps music.ly and Tinder. I couldn’t download the music.ly application on my iPhone with a China App Store account because the service is specifically targeted at overseas regions. Chinese game firms like Shanghai-based Yoozoo are also expanding in the rapidly growing Indian market. By 2034, the revenue of India’s e-commerce market is forecast to surpass that of the US, placing the world’s No. 2 market behind China globally, said researcher Worldpay. Meanwhile, India’s data traffic cost is relatively low, a key catalyst to the growth of mobile applications and sales of smartphones. Carriers AirTel and aggressive newcomer Jio offer users unlimited 4G data packages, covering retailers and channel partners with lucrative offers nationwide. My traveling companion, using his passport, easily bought a SIM card costing just 199 rupees for monthly data package — a fifth of the cost of a package in Shanghai. Oppo, Xiaomi and Vivo have become well-known brands in India, as we learned from people we talked to — from street taxi drivers, shop owners to hotel staff. A hotel manager in Delhi held my friend’s Xiaomi Mix 2 for 15 minutes with various questions about price and features. The guesthouse staff in Bundi used an OnePlus model — also a Chinese brand focused on overseas markets — to watch broadcast programs. These trends have not gone unobserved by industry analysts and researchers. 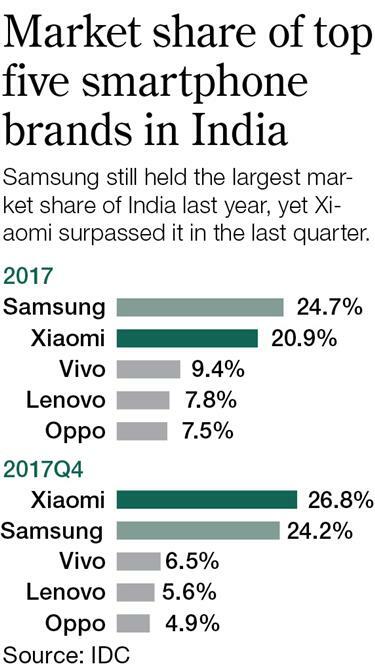 In the fourth quarter, China’s Xiaomi beat Samsung to become the leading smartphone brand in India. Vivo, Oppo and Lenovo were among the other top five vendors, according to a report by researcher Canalys. In 2017, China-based vendors took a combined 53 percent of the market in Indian smartphones, up from 34 percent a year earlier. Vast untapped demand exists in lower-tier cities, said IDC. India’s local brands are more focused on the entry-level market, offering affordable 4G-enabled feature phones. Chinese brands are expanding into the market segment of phones costing 15,000 rupees or more. In the premium segment, I didn’t see people on the streets using iPhone X or Samsung’s flagship models. Ael, the guesthouse owner’s son, who used to work in New York, was using an old iPhone 5. Chinese vendors are increasing investment to consolidate their footprints in India. Xiaomi, which just introduced new smartphones and TVs in India recently, plans to open 100 stores in the country. So, it wasn’t strange to see Chinese brands frequently during my trip. They included Xiaomi’s advertising in the front page of the national newspaper Times of India, Vivo outdoor advertisements covering the whole wall of a Delhi metro station, and a OnePlus ad in the Delhi Indira Gandhi International Airport. Vivo also sponsors the Indian Premier League (IPL) until 2022, the biggest cricketing game in the world.